The Philippines is one of South Koreans’ favorite travel destinations, with over 1.61 million traveling from the peninsula to the archipelago in 2017. That year, South Koreans made up the largest number of tourist arrivals in the Southeast Asian country. In addition to its touristic charm, the Philippines is also rising as a prospective country for foreign investment, with its annual economic growth at over 6 percent, according to the Korean Embassy in the Philippines. “The Philippines has a market for Korean exports and has a population of about 100 million,” Korean Ambassador to the Philippines Han Dong-man said in an interview with The Korea Herald on July 10. On the same day, Han met 70 students from Korea, Japan, China and the 10 Association of Southeast Asian Nations members, to introduce the country and its relations with South Korea. The students were participating in the ASEAN-Korea Youth Network Workshop organized by the ASEAN-Korea Center and Asian Center at the University of the Philippines in Manila. “The country’s high growth rate is expected to be maintained as the government is encouraging foreign investment by lifting regulations and implementing policies to lead infrastructure construction,” Han said. Led by President Rodrigo Duterte, the Philippine government has embarked on the Build-Build-Build project, injecting $180 billion to build more subways, highways and other infrastructure. Its economic progress has also led to a steady increase in the country’s smart phone penetration rate and internet connectivity. About 40 percent of the population of 100 million have mobile phones, and it is forecast to reach 80 percent by 2021, according to an Ericsson analysis report on Southeast Asia and Oceania published in March 2016. Appointed in January, Han is responsible of the safety of an increasing number of Korean tourists and over 93,000 Korean residents in the Philippines. 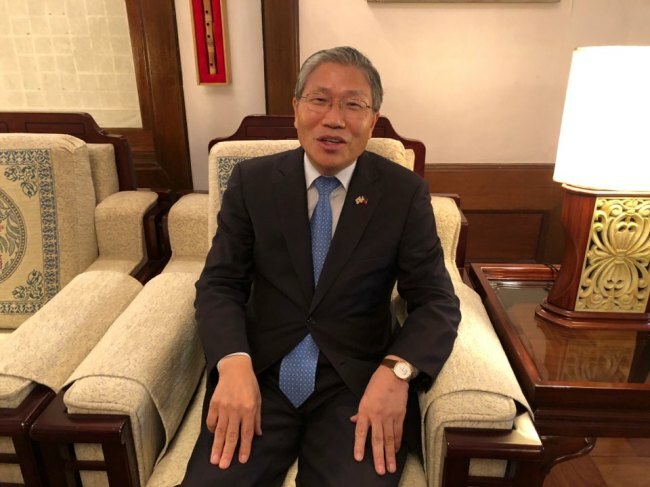 Prior to his posting to the Philippines, Han was deputy minister for overseas Koreans and consular matters in charge of safety and security of the approximately 7.4 million Koreans living abroad. Han started his diplomatic career in 1985. “The Philippines was the first ASEAN country to establish diplomatic ties with South Korea in 1949, and next year marks the 70th anniversary of the relationship. It is also one of the closest ASEAN countries to South Korea,” Han said. Aware of the difficulties overseas Koreans are likely to experience, one of the first tasks Han embarked on was the publication of guidelines for adapting to life in the Philippines. “Safety is one of the main concerns, and it is also important that Korean nationals respect and follow guidelines to avoid conflicts in their daily lives or their visits to the Philippines,” Han said. In the Philippines, there is a cultural trait called “Hiya,” which translates into “shame” in English -- a feeling of humiliation that one feels when one has not met customs or standards in a social situation. To raise South Koreans’ understanding of Filipino culture and reduce possible conflicts, the Korean Embassy published a guidebook that provides information on the country’s cultural background. Han set 10 principles for people to follow, including respecting Hiya culture, drinking less on the weekends and holidays, not carrying valuables in public venues and being careful when taking a taxi late at night. “I visited 11 regions, including Cebu and Davao, held safety forums with the Korean residents and met with the commissioner of the district police agencies to come up with safety measures for Koreans,” Han said. Regarding safety concerns, Han explained that cooperation between the police forces of the two countries has reduced the risk of danger in the Philippines. The Korean Desk System, implemented in 2010, dispatches South Korean police officers to several regions in the Philippines to protect South Korean nationals. On May 29, Han and the chief of the National Police Agency of Korea held an event to donate 130 police cars marked with the symbol of the Korean police. The Korea International Cooperation Agency, a state-run overseas aid agency, is conducting a $6.6 million project from 2016 to 2020 to boost the investigation skills of Filipino police. “Annually, there had been an average of 10 Koreans killed in the Philippines, but the number was reduced to one victim last year. I believe our continued efforts are behind the drop in the number of victims,” Han said.